As someone who is not a good sleeper, I need "calming" rituals before bed to get settled for a good night's sleep. When you add a 4 month old infant on top of that, I really need all the help that I can get! :) My nightly ritual of aromatherapy lotion application is one that I really look forward to every evening. For years (I mean, like 8-10 years! ), I have been using Bath and Body Works Aromatherapy Sleep Lavender & Vanilla Body Lotion. I have repurchased it countless times and absolutely adore the scent. Sometimes falling asleep is a mind-over-matter process. I actually do "believe" that the calming scent of this lotion helps lull me to sleep! With all that said, I recently ran out of my beloved B&BW Sleep lotion. But rather than repurchase, I reached for this new Daily Moisture Lotion by Lubriderm in the Calming Lavender Jasmine scent! No, its not a dupe for the B&BW lotion. Actually, I think I like it better, gasp! The scent of the Lubriderm is much lighter and subtle plus it has the addition of the lovely notes of Jasmine. It smells heavenly, is super affordable, and you can pick it up right at your local drugstore for $6.99 for 16 fl oz. 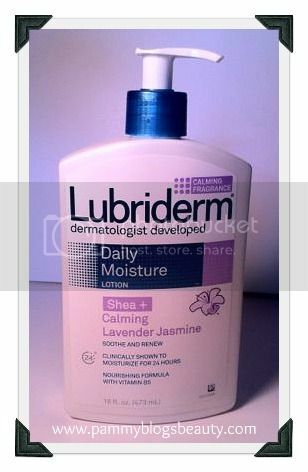 Lubriderm's Calming Lavender Jasmine Lotion is a light and non-greasy lotion that you can use on both your hands and body. Interesting: After Lubriderm's consumer trials, testers actually reported that they felt more relaxed, comfortable, and at ease after using this lotion! From my experience with this product and aromatherapy in general, I totally agree! The scent is just lovely and it lingers nicely on the skin. Do any of you have any calming bedtime rituals? Or, are there any other aromatherapy fans out there? I take my showers now at night instead of the morning and the warm water winds me down. I then use something to calm my itchy skin, generally from Shikai. Lastly, I watch makeup videos in bed on my iPad and when my eyes won't stay open, I turn off the light and go to bed. Seriously, I am out in less than 10 minutes! I'm a total aromatheapy fan and love how scents always remind me of a certain memory. I will look for this, it sounds interesting! @Suselew-Thanks for sharing your bedtime routine! Sounds relaxing!!! The iPad is seriously the best invention ever! @TinaB-That is so true! I always get hit with memories while smelling particular scents. :) So cool! Pammy, it's true: scent is the strongest sense tied to memories (like my Grandma's homemade rose face dream and my Mom's chicken soup! Maybe your daughter will one day relate the smell of lavender with you!